Lupus is an autoimmune disorder that can affect many parts of the body, including the joints, kidneys, heart, and lungs. Some of the most visible symptoms of the disease, however, involve the skin. According to the Lupus Foundation of America, approximately two-thirds of people living with lupus will experience some form of autoimmune-related skin disorder. Moreover, anywhere from 40 percent to 70 percent will see a worsening of skin condition when exposed to ultraviolet (UV) rays, either from the sun or artificial sources. Chronic cutaneous lupus (CCL) is defined by the persistence of the skin condition. The most common form is discoid lupus, characterized by thick, scaly patches of skin that appear most often on the cheeks, nose, and ears. They can also develop on the back of the neck, the upper back, and the back of the hands. Discoid lesions can either be hypertrophic in appearance (thick and scaly) or verrucous (wart-like). If an outbreak involves an area of the scalp or beard area, it can cause significant hair loss (alopecia). Furthermore, any scarring left behind can make it impossible for the hair to grow back. Even after the CCL lesions have resolved, they can leave patches of a darkened or lightened skin as well as visible atrophy (thinning of the skin). CCL may be limited to just the skin or hint at a wider, systemic event involving other organ systems. Doctors refer to this as systemic lupus erythematosus (SLE). All told, around 10 percent of persons with discoid lupus will develop SLE. Discoid lesions are reactive to light, so every effort should be made to avoid sunlight and to use a sunscreen higher than 30 SPF. This is especially important since long-standing lesions may predispose a person to skin cancer. 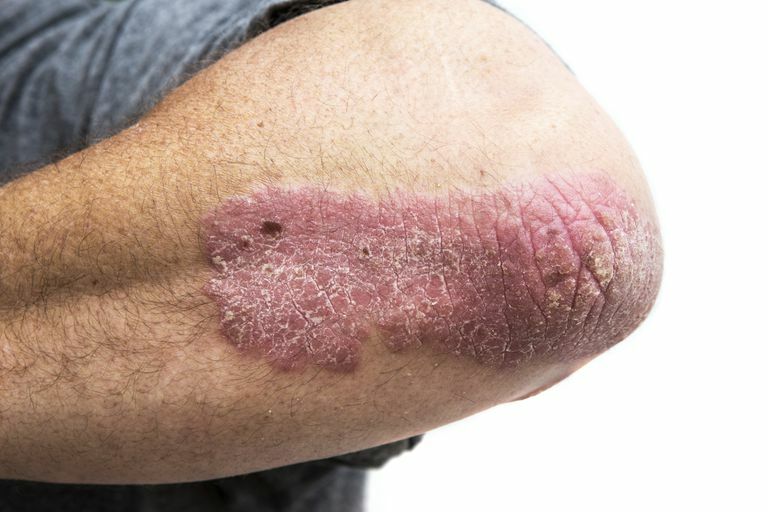 CCL lesions can typically be treated with corticosteroid creams, ointments, gels, tapes, and solutions. SCL lesions will commonly appear on sun-exposed parts of the body such as the arms, shoulders, neck, trunk, and sometimes the face. The lesions themselves do not itch and are not as commonly associated with SLE. As with discoid lupus, persons with SCL should avoid sunlight and tanning beds as this will almost invariably worsen the condition. Topical cortisone is also the most common form of treatment. Acute cutaneous lupus (ACL) is characterized by flattened areas of red skin that appear on the face in a distinctive, butterfly-shaped pattern (also known as a malar rash). The photosensitive lesions may also develop on the arms, legs, and trunk. While ACL lesions can sometimes discolor the skin, they generally do not scar. As such, any hair loss that may occur would likely be temporary. The appearance of ACL lesions is usually symptomatic of SLE and may be accompanied by other skin issues such as hives, oral ulcers, and vasculitis (damaged blood vessels that appear as red or purplish bumps, usually on the lower legs). Because ACL is often part of a broader, system-wide event, steroids like prednisone may be used to treat inflammation and accompanied by immunosuppressant drugs to dampen the autoimmune response. Lupus Foundation of America. "How lupus affects the skin." Washington, D.C.; published July 12, 2013. Okon, L. and Werth, V. "Cutaneous Lupus Erythematosus: Diagnosis and Treatment." Best Pract Res Clin Rheumatol. 2013; 27(3):391-404. DOI: 10.1016/j.berh.2013.07.008.